I am an amateur photographer and enjoy travelling and taking pictures, lots of pictures. One of the problems I had, and the reason for this review, was to find a product which allowed me to see all of my pictures on all of my devices. Both Apple and Adobe have products which address this but the developers who write these programs seem to feel that everyone has very high speed internet at all times and oodles of cloud storage. This isn’t the case for me. When Photos was announced a few years ago I felt it would be the solution to the issue of distributing my images to all of my devices. I had two obstacles to get around. Primarily it was the number of images. When I am travelling I might take 3 – 4 thousand pictures each of which is a 50 Meg RAW file. I don’t want them all in the cloud at that point in my workflow as it would be incredibly slow and, in many locations, impossible. The second obstacle was that I enjoyed working in Lightroom and wanted to continue to use it as my editor. So my workflow became a process whereby all of my images went into Lightroom and then after they had been culled and processed some of the ‘keepers’ would be exported as JPEGs and imported into iCloud Photos and then become available on my devices. If I re-edited a picture in Lightroom then the export/import process needed to be done again. I was recently introduced to a product called Mylio. This is a photo organizer and editor. It would appear to have many of the same editing capabilities as Photos but I haven’t used either as an editor so can’t talk to those features. 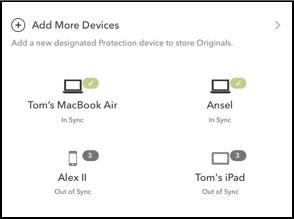 However, the brilliant aspect of Mylio, for me, is that it looks after ensuring that all of my devices have synced copies of all of my photos. It also monitors my Lightroom folders so as soon as I add or change an image in Lightroom it gets synced onto my devices. (The sync takes place when the internet is available and the devices are running the Mylio app. ) No more exporting and no more importing. Mylio can also be used to ensure that you have copies on external drives and/or cloud services so that you always have the number of onsite, offsite, and cloud backups you define. Mylio can sync originals or previews. In my case, I have the originals on my main machine and sync them to my onsite and offsite backups. My iPad and laptop get medium size previews and my iPhone gets small thumbnails. More than enough to get a good image on that particular screen but small enough to hold lots of pictures. The result is that I have access to a version of all of my pictures even without the internet. Mylio has apps for Android, iOS, macOS, and Windows. It is free for users with less than 25,000 pictures and with up to three devices to keep in sync. The free version does not come with the Lightroom integration or the ability to import RAW files. So I use their Premium plan which is $100 per year for up to 5 devices and 100,000 pictures. By the way external, NAS, and cloud drives don’t count against your device limit. There are a lot of features I haven’t yet used but so far it seems to be a well-conceived and well-built product. I have contacted support twice and had very prompt and helpful replies. The search function works incredibly fast. The editing/organizing options include face recognition, sorting by places, people, date. Any editing is non-destructive so you always have your original image available to you. 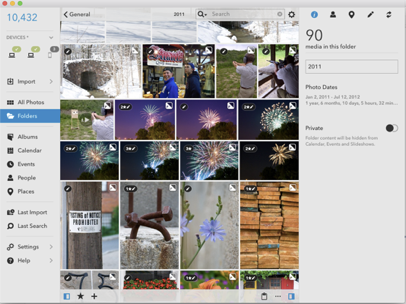 Mylio will import images from Flickr, Photos, Aperture, iPhoto, and Facebook. As I get more comfortable with the organizing features I will start spending more time assessing the capabilities of the editor. 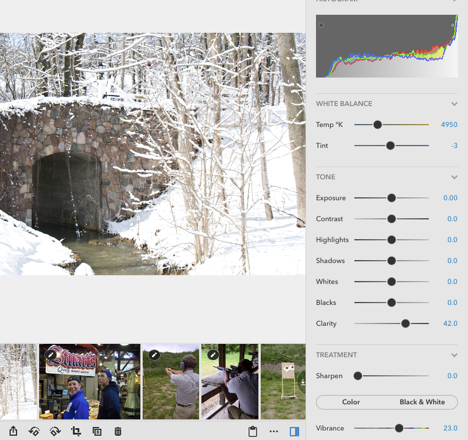 This is a new product by a small company and could quite possibly replace Lightroom for many people. For more information go to Mylio.com. If you are interested you can sign in for their 30 day free trial of the Premium product. That’s it for this review. Now back to processing pictures. Which is Worse: iBooks Author or Pages Book Creation?